Triathletes Journey: A "He said, She said" reporting on races and events: Does sledding count as a workout? Elle: Not when there's a conveyor belt that brings you to the top of the hill. We took this past Saturday off to go tubing with our friends Lenny & Lisey at the Amesbury Sports Park. 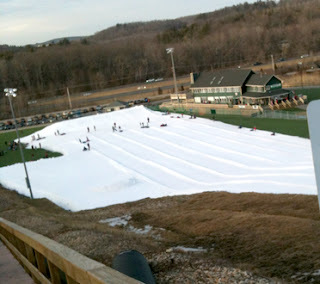 We had a fun time with friends, but I have to say, the experience would have been a lot more fun if they had let us walk up the hill instead of forcing us to use the human conveyor belts. We would have gotten some exercise in and kept warm in the process. You can see Webb and I nearing the bottom of the hill in this video taken by Lenny. Keep in mind, we didn't add any music to this, that is the music that they blast at the park. Fun times. Elle: We were supposed to do a workout Saturday night, but both of us were feeling slightly under the weather. Tired and lots of sneezing. I'm still sneezing. A low-grade bug, perhaps? Webb: I was tuckered out. I fell asleep in the car on the drive back. It was only about a 60 minute drive, yet, I could not stay awake. After I kicked off my cold, damp shoes I told Elle I was going to lie down for a bit. Two plus hours later I emerged from the bedroom in a disoriented haze with a slight queasiness in my stomach. Elle: We got up Sunday, and after much procrastinating and time-wasting, we finally got out for our "long" run. But because we spent so much time putzing around, it ended up not being as much as a long run as planned. I had to get to a massage that was booked for 12:30pm (70% of the proceeds for this special event went to support the MSPCA). But I got almost a full hour in. Webb: I was pretty miserable for the first 40:00. I felt like I was holding an asthma attack at bay. Very little air was getting into my lungs and I kept coughing. Surprisingly, my HR stayed pretty low. I thought with the lack of oxygen my HR would kick up. I've heard that Michael Phelps' coach monitors his HR and if it does not elevate by a certain point he pulls him out of the pool because it indicates he needs a rest day. I thought that might be the case with me, except I already had a rest day the day before. With about 20:00 left in the run, I started to feel normal. The last 10:00 I actually felt good and considered pushing the run out to 75:00. Alas, I remembered I promised to drive the Lovely Elle to her appointment. Elle: Thanks for the ride, Webb.